Looking for things to do in Rotorua, NZ? This geothermal wonderland is one of New Zealand's top destinations, with plenty of hot springs and volcanic activity, while maori culture is likewise at the forefront with numerous cultural experiences and ceremonies for visitors to part in. 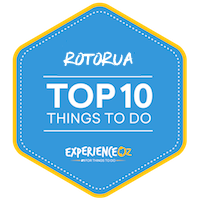 Visit the set of The Hobbit, see the geysers and volcanic pools of Te Puia, experience Tamaki Maori Village and take part in any number of Rotorua tours - the choice is yours. Browse our range of Rotorua experiences here and book online today! The highly popular Rotorua region at the heart of New Zealand's north island is a geothermal hot spot that offers a great example of all the best of the country's major highlights in a single, interesting and visually impressive location unlike few other places in NZ. Famed for its volcanic landscape, the region has been shaped by millions of years worth of activity that have given it its distinctive character. Rotorua is teeming with Maori history and culture that blends seamlessly alongside wonderfully scenic lakes while also providing opportunities for adventure and adrenaline for those wanting to kick things up a notch all while surrounded by its famously active geothermal features. The region is constantly steaming in many locations, with thermal reserves showcasing its various bubbling mud pools, hot springs and spouting geysers which make for some of the most surreal vistas in New Zealand. If you're planning to visit this rich and steamy cultural wonderland, here's our recommendations for 10 of the top things to do in Rotorua, NZ and its surrounding areas. Capping off the list of all-things-geo that is Rotorua is Wai-o-Tapu, an incredibly colourful grouping of hot springs, geysers and pools each with their own distinct character, shape and texture formed solely by nature itself which sits around 20 minutes south of Rotorua city. This is the place that you've most likely seen in postcards or promotional material promoting Rotorua as a travel destination, and with good cause; it's the most colourful volcanic area in the country and allows visitors some great angles for photos as you're able to basically step right up to – or in some cases, walk directly through – some of the most striking hot pools you're ever likely to see. Wai-o-Tapu also combines the three essential sights of any geothermal hot spot (prominent geysers, naturally boiling mud pools and volcanic vistas) in a single location, making for a comprehensive experience. The area is broken up into three separate tracks coded by colour, each of which emphasize a different aspect of the grounds and none of which are difficult and which will take you roughly 3 hours to complete, all set within a lush green valley bordered by forest and farms. "This is the place that you've most likely seen in postcards or promotional material promoting Rotorua as a travel destination, and with good cause; it's the most colourful volcanic area in the country and allows visitors some great angles for photos." One thing you'll soon notice upon embarking on your walk is the smell; the gases which contribute to all the activity here aren't just visual thing, and for some the sulphur and various other oxides can be uncomfortable if not overpowering, and are a necessary ingredient in what makes the place tick. Perhaps Wai-o-Tapu's most famous highlight is its Champagne Pool – a bubbling hot spring around 65 metres wide with a mix of elements such as arsenic and sulfide that give its border a bright orange colour and contrasts beautifully with the water contained within. The Lady Knox Geyser, meanwhile, is another must-see that spouts regularly at 10:15am but which now requires human aid to reach its full spout-y potential, and which lasts for around 30 minutes; crowds quickly gather before eruption time, so be sure to get there early if you're wanting an unobstructed view. Various other colourful natural characters round out the locale including the Artist's Palette (which you can cross via a wooden bridge), Devil's Bath, and other similar creatively-named highlights. Home to everything a traveller could want out of a natural Rotorua experience, Wai-o-Tapu is well worth the price of admission and then some. Steaming this list up once again is the Waimangu Volcanic Valley, full of amazing thermal activity that allows visitors to walk through a wild, active landscape. With an emphasis on ecological values, the valley offers a range of walks or hikes past steaming craters, native plants and plenty of bird life to form an impressive tableau that simply screams “Rotorua” in every way. It's about as close to a “volcanic park” as you're able to get without mankind having a greater influence on its layout, and the world's youngest geothermal site is easy to explore here due to the many well-planned paths which allow for some truly up-close viewing experiences. As the result of a volcanic eruption over 100 years ago, the various boiling springs and geysers are so close you could touch them at many points throughout the trails – however unless you want your skin scorched off, this is highly inadvisable. While guided tours are available, you don't need one to enjoy yourself at Waimangu; the area does well to cater for tourists and has plenty of information as well as detailed walking maps that show the many highlights along each of the two main tracks available to take. Fresh, crisp alpine air, soft white snow, cool temperatures and an amazing range of mountains — the winter in Queenstown is every skier and snowboarder’s dream. It's possible to spend a full day here as each direction can take up to 4-5 hours to see everything, so ensure you wear solid hiking shoes and take your time. The colourful spectacle is definitely what makes Waimangu Volcanic Valley so interesting; volcanic pools are famous for their strong, sulphur-induced colorations and here is no exception; vivid blue-greens exemplified best by the large Inferno Crater and its pool rule the day, while the area is also rich in green forest which contrasts nicely with the rocky landscape and bright waters. There are few spots in New Zealand – let alone the world – which blend both bushwalking with volcanic activity better than Waimangu does, and the walk for it as about as accessible as such an active place as this could be. 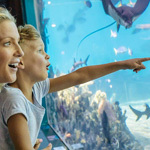 In line with this convenience, there's even a restaurant and gift shop to provide visitors with a bite to eat or a keepsake from their visit. Representing great value for money and a less crowded alternative to other sightseeing experiences, Waimangu Volcanic Valley is an essential Rotorua itinerary item – just be sure to bring your camera! This relatively new experience on the Rotorua tourism scene has done an excellent job of filling somewhat of an "adventure gap" on New Zealand's north island - since its inception in 2012, Rotorua Canopy Tours has won numerous well-deserved awards for walking the fine line between conservation and tourism. A multi-hour experience that sees visitors navigating an enjoyable, mixed web of around 1.2km worth of bridges, flying foxes, ziplines and platforms above a slice of extremely verdant native forest, the company offers the chance for an entirely different look at the wilderness that surrounds Rotorua. Visitors join their friendly and patient guides, receive detailed safety briefings, then harness up in small groups of a maximum of 10 people. Once prepared, guests embark on an adventure that sees them soaring through treetops at heights of over 20m above the forest floor, weaving between a mixture of chirping rainforest bird life and trees up to 1000 years old. It's a delightful balance between education, tourism and conservation working hand in hand to achieve stellar results - the company is entirely eco-friendly and makes concerted efforts to contribute towards the conservation of the forest as well as its inhabiting animals. Such efforts have included trapping threats to native plants and animals; a key reason why the quantity of bird life is much higher in recent years. [Rotorua Canopy Tours] is a delightful balance between education, tourism and conservation working hand in hand to achieve stellar results. Participants can choose between two main experience types - the Original and Ultimate Canopy Tours that each offer a blend of sub-experiences, albeit on a different scale. Standard visitors may want to stick to the Original itinerary, as it provides a solid cross-section of bridges and ziplining, while those with an extra adventurous bent can opt for the Ultimate version. This sees everything ramped up a notch - it's higher, longer (400m longest zipline as opposed to 200m on the Original tour), and includes a spot of cliff walking and abseil-type activity. The resultant views are even more breathtaking in return for your efforts, however, so it's definitely worth considering if you're the "outdoorsy" type. Regardless of your choice of itineraries, the team at Rotorua Canopy Tours do a great job of placing an emphasis on safety while still keeping you feeling comfortable. Likewise, elements of education are also incorporated throughout, however they're delivered in a fun, upbeat and "non-preachy" fashion. If you've ever wanted to explore a slice of pristine rainforest and feel as close to a bird yourself, this experience in Rotorua is one of the closest things to it - and one all ages can partake in and appreciate. Culture plays a huge role in making Rotorua what it is, and while it's hard to gain a true appreciation of such a deep and traditional one as that of Maori while only visiting on holiday, Rotorua's “Maori Villages” attempt to do their best to provide a distilled, tourist-friendly version of it to interested visitors. Rotorua has two such attractions – the Tamaki and Mitai Maori Villages - both of which are highly regarded and incorporate a blend of ceremonies, music, storytelling, dance and dining into a single package that's as entertaining as it is informative. Each of these also puts a premium on audience interaction and participation, and both aim to be as authentic to their roots as can be while still providing entertainment to visitors from all over the globe. Tamaki Maori Village, which can be found on the outskirts of the town near Lake Rotorua and the Rotorua Museum (mentioned in greater detail below) offers a substantial 3+ hour experience in the midst of Rotorua's ancient Tawa forest. Visitors who attend can take time to explore the village, listen to various stories on both history and legend, witness rituals and art, and view song and dance performances all culminating in a traditionally-prepared Hangi dinner by the attraction's Maori hosts. Step back in time – before the days of European settlement - and explore the Maori way of life, including the small dwellings, the arts and the songs; watch the women weaving, see the warriors training with traditional weapons and openly talk with the villagers about their heritage. It's one of the best value culture-based experiences in New Zealand when you factor in that you're getting dinner and accommodation transfers as well, and a great way to spend an evening in Rotorua if you're looking to fill out your itinerary. Alternatively you can find Mitai Maori Village located just 5 minutes drive from Central Rotorua offering you an authentic cultural evening incorporating a traditional earth cooked Hangi Feast. Mitai Maori village is a 100% family owned operation and with the village standing on traditional Maori land, they are people of the land. Witness warriors in traditional dress paddle in an ancient canoe. Be captivated by the displays of weaponry, Haka, coupled with the grace of the poi dance. Here you will learn about traditional carvings and ta moko (tattoo art). There is also time to marvel at the sacred Fairy Spring flowing from earth and see glow worms in their natural habitat. Mixing a blend of seriousness and lighthearted humour while still providing historical insight is a difficult thing to do, but Mitai handles it well, incorporating guided explanations and Q&A sessions that answer any queries on the techniques or history that guests may have, as well as a walk through the rainforest and a canoe piloted by costumed staff which adds to the overall atmosphere. It's smaller and more intimate than Tamaki, which can either be a good or bad thing depending on what you're looking for. While the Maori culture stretches back a long time into the past, both of these villages aim to break as much of it up as possible into a bite-sized morsel that will at least give visitors an overview. If traditional adventure activities bore you or you feel like you've done them all before, Rotorua's Velocity Valley (formerly Agroventures Adventure Park) is almost certain to offer something that even the most seasoned activity junkie has most likely never tried. The park features a range of rides-slash-activities that utilise different machines and mechanisms to put a different spin on your standard outdoor activities, ranging from the world's only jet-sprint experience to New Zealand's only wind-column free-fall skydive simulator to its weird and wonderful “Shweeb” pedal-powered capsule experience and more, with 5 in total all situated mere metres from one another. Not just a place merely for kids, Velocity Valley is just outside Rotorua provides and entirely original way to spend a few hours or a full day. Each ride is unique in its own way, and will appeal to different people. The bungy jump is obviously the most extreme as it towers 43m above the ground and provides some great views from atop the platform. While it's not as “extreme” as some of the other bungy experiences available in New Zealand, it's still bungy jumping, and provides all the expected rushes of free-fall and adrenaline one might expect, while also serving as a good way to introduce yourself to bungy in general if you've been thinking about tackling some of the larger jumps in NZ. Next on the extreme scale is the Swoop experience – similar to rides such as the Shotover Canyon Swing in Queenstown – which allows up to three people to hop inside a secure body harness, be winched up to 40 metres above the ground, then pull a ripcord and drop-then-swing at speeds of up to 130 km per hour. It's a slight step down from bungy jumping, but still provides a free-fall and a pretty darn cool feeling while suspended. If traditional adventure activities bore you or you feel like you've done them all before, Rotorua's Velocity Valley is almost certain to offer something that even the most seasoned activity junkie has most likely never tried. The Agrojet adventure takes regular jet boating experiences and kicks things up a notch; more like a rocket on rails than a regular boat, you'll join a skilled driver on board and they'll take you at ridiculously high speeds (up to 100km/h) on a dedicated sprint course and perform various manoeuvres such as weaving around tight islands, high-paced 360 degree spins and much more. The free-fall extreme serves as New Zealand's only wind tunnel, emitting powerful enough air to suspend customers in mid-air and try their hand at performing various rolls and spins. The experience aims to emulate the feel of skydiving without actually having to head up into the air, and those participating will wear a full-body flight suit that helps maximise the impact of the air to propel your body. It's a great option for those who aren't game enough to skydive for getting a sense of the feeling your body goes through during that experience. The last – and perhaps the weirdest – of the activities is the Shweeb; explaining it with words is hard to do, but it's basically a human-propelled monorail in which each passenger is given their own carriage to push along. Participants hop inside their bullet-shaped capsule, lie down and then simply pedal as fast as they are able, racing one another to the finish line over the course of the 600m “track”. This can be done in tandem for extra teamwork, and they even offer a $1000 prize if you can beat the existing fastest time. If you're feeling like you've done all of the world's rides, attractions and activities before, you'll definitely want to pay a visit to Velocity Valley for a refreshing take on the typical fun park routine. Rotorua isn't just all sights and steam; it's also one of the more adventure-oriented destinations in New Zealand, and no activity exemplifies this better than white water rafting with River Rats, which has continued to grow in the region over the years to become one of its most popular activities. Visitors to the Rotorua region who are looking for some group-oriented white water fun will be able to make their choice between the thrill of the more challenging Kaituna River with its steeper drops and more heart-pounding rafting opportunities, or instead strike a solid balance between sightseeing and a dose of rafting fun on the more mellow – yet still impressive - Rangitaiki River. Both of these waterways are set amongst some stunning scenery typical of Rotorua's surrounds, and serve as the ideal backdrop for this wet-and-wild kind of experience. The Kaituna River – reachable just 15 minutes from the heart of Rotorua city – boasts the highest raftable waterfall (Tutea Falls, at a height of 7 metres – hold onto your butts!) on Earth and makes for a thrilling experience for those who are looking for adrenaline on the water. The adventure down the Kaituna is a wild one, with 14 separate rapids along the way as well as three waterfalls and a myriad of other whirlpools and bumps. The river is also known for its warmth, which can help take some of the sting out of getting soaked – particularly if you're looking to raft during the colder months of the year. A rafting trip on the Kaituna takes roughly 45 minutes (1 hour total including training), and with a huge, rush-inducing drop along the way this particular course can make for one of the most enjoyably-extreme rafting routes in NZ. Those looking to keep their pants unsoiled may instead opt for the Rangitaiki River, which while still challenging (rapids are still “up there” ranging from grades 3 to 4) is more of a laid-back journey that allows you to focus on the scenery while encountering periodic rapids along the way. It's a little further from Rotorua than the Kaituna is – expect a 45 minute journey to get there – but for a white water rafting experience that's ideal for families and the less extreme among us it makes for a solid choice. You'll get a taste of the bumps and splashes typical of white water rafting while still having time to set back and admire the view of native trees and their wildlife inhabitants which line the riverbanks. An even smoother course on the Rangitaiki that's perfect for those with younger kids looking to participate is available too, with only smaller Grade 2 drops encountered along the way. One of Rotorua's most iconic adventure activities that blends pristine waters with a rush and great group fun, white water rafting can be enjoyed by all. If you've got deeper pockets and are looking for what is basically the ultimate in sightseeing experiences in the Rotorua region, then there are few better choices than setting out on a helicopter trip to gain a whole new perspective of New Zealand's many volcanic marvels. 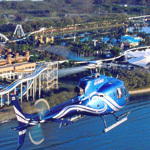 Visitors to the region are able to choose from an extensive range of flight options either by taking a helicopter ride or a floatplane where take off and landing are done entirely on the water. Some of the region's most impressive attractions are best both viewed and accessed by air, with the steaming pools of Hell's Gate and Waimangu, the Buried Village and even the incredible sea-volcano of White Island all viable and popular options run by local operator Volcanic Air. Each of these itineraries have their own merits; Hell's Gate is perhaps Rotorua's famous – and active - geothermal attraction, with its bubbling mud pools, steams and geysers taking on a whole new life when viewed from the air, as the helicopter pilots are skilled and knowledgeable enough to give you a great vantage point while airborne while following it up with a landing and guided tour of the mud pools. Perhaps the most unforgettable of these natural highlights, however, is the stunning panorama of White Island – the country's only active marine volcano that regularly emits clouds of gas, making for an impressive spectacle. Waimangu, meanwhile, is a fascinating area with plenty of interesting geographical features that is of great significance to the indigenous Maori people, and spectacular aerial views of the steaming cliffs and boiling lakes of the Waimangu Volcanic Valley have to be seen to be believed. Perhaps the most unforgettable of these natural highlights, however, is the stunning peak of White Island – the country's only active marine volcano that regularly emits clouds of gas, making for an impressive spectacle. Sitting 48km off the coast of the mainland of the Bay of Plenty region, volcanic and geothermal tours to White Island present an opportunity for the adventurous to explore one of New Zealand's most unique landscapes. On the surface, it's a truly prehistoric-looking landscape, with its continually active status leading to an impressive cavalcade of spectacles happening at all times – roaring steam vents and an ash-soaked ground combine to create an eerie, moon-like environment that has to be seen to be truly appreciated. While it takes a reasonably lengthy helicopter ride from Rotorua to reach, the panorama it offers is unlike anything else in NZ. Regardless of which flight itinerary you choose, you'll be accompanied by a highly knowledgable and informative pilot/guide who will provide you with a local's insight on all the local history and geography, and passing above the varied terrain of Rotorua – including its numerous lakes, thick forested areas and steam-venting geological features – from high above is a must-do if you're willing to spend to make your journey an unforgettable one. While a mouthful to pronounce, Whakarewarewa Forest is easy to enjoy as this vast area of natural offerings is varied enough to offer something for everyone. Its Redwoods at Whakarewarewa Forest are impressive in size and scope, and form a great backdrop for a range of outdoor adventures. The ideal spot of choice in the Rotorua region for lovers of the traditional (read: non-volcanic) outdoors, all it takes is a short 5 minute drive from the city centre and you'll soon find yourself what feels like a world away, surrounded by immense Californian Redwood trees up to 60m tall which were originally planted around Rotorua back in 1901. It's now a place where both locals and visitors alike can go to both explore the forest and enjoy various outdoor recreational facilities; biking, horse riding and even simply walking are all enjoyable when immersed in such wonderful surroundings. Each of these three core activities are separated out into their own separate pathways and directions for both safety and enjoyment reasons, and with the area open every day of the year there's a chance to take part in whichever most appeals to you throughout all seasons. The changing colours make Whakarewarewa Forest a favourite spot of local photographers, as the greenery mixed with the sheer scale of the trees and bush make for some pretty scenery that's great to explore regardless of method. Perhaps the most renowned activity in the area is mountain biking, with the tracks of various levels throughout Whakarewarewa Forest receiving worldwide acclaim despite being some of the oldest bike tracks in all of New Zealand. This is a testament both to the beauty of the surroundings and the continued maintenance work put in by the dedicated people of the local Rotorua Mountain Bike Club who help to keep the tracks in tip-top condition; and this is no small task, given that there are more than 60 tracks spread out over a distance of over 145km in total. The ideal spot of choice in the Rotorua region for lovers of the traditional outdoors, all it takes is a short 5 minute drive from the city centre and you'll soon find yourself what feels like a world away, surrounded by immense Californian Redwood trees up to 60m tall. Tracks are available that range from short beginner courses to more strenuous and advanced routes aimed at the experienced mountain biker, and the craftsmanship of the trails combined with the quality of their riding surfaces and blend of scenery more than justifies its reputation. Horse riding is likewise popular here, with dedicated trails that wind their way through groves of Redwoods, to various lookout points with views of Mount Ngongotaha and Rotorua, and all the way down to the floor of the nearby valley which is ripe with ferns and various native species of floral beauty. Horse riding in the forest is generally recommended during the summer months due to typically firmer track conditions reducing the likelihood of the horses stumbling along the way. Signs indicating which paths to follow for horse riders are dotted throughout the tracks, so if you make sure to stick to these you'll likely be fine. In terms of walking, aspiring trampers will be spoiled for choice, as the range of tracks are numerous with everything from slower, romantic walks that emphasize taking it easy to those designed to get the blood pumping. All designated tracks begin from the Redwood Grove starting point, and branch out in various directions with their difficulty levels indicated by signs broken up into three categories: Short Walk (under 1 hour return trip), Walking Track (anywhere up to a full day return through plenty of greenery and some crossing water), and Tramping Track (designed for fitter people and may head directly into the back country for a multi-day adventure). 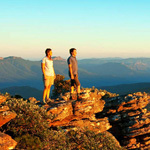 With a range of views and sights that are too numerous to mention here, which choice is right for you will largely depend on your personal fitness level as well as how much time you're willing to invest. It's said that one of the best ways to judge the true quality of an attraction is to see how many locals can be found there, and with its excellent facilities including good toilets and parking, Whakarewarewa Forest is a must visit at the best possible price – FREE. The largest of the volcanically-formed lakes in the region, Lake Rotorua stands out from many other New Zealand cities bodies of water due to both its formation and colour. The Rotorua region's volcanic origins are reflected in the lake, which is actually quite shallow at an average of 10m deep, and which combined with its high sulphur content results in a shifting, green-blue-yellow palette that constantly changes. With its location situated on the north side of the city, Lake Rotorua provides visitors with a focal point for a large variety of activities and other aquatic things to do - with perhaps the most iconic of these being its Lakeland Queen cruise boat. The charming Lakeland Queen paddle boat provides combined sightseeing/dining experiences aboard a peaceful vintage-style vessel. 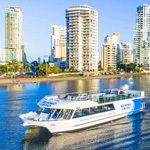 The cruise is offered in both breakfast, lunch and dinner flavours featuring some wonderful food and a good selection of menu items, and also has two licensed bars on board, giving you the chance to enjoy a beverage on one of the two separate decks as the greenery of the lush New Zealand countryside rolls by. It's by far one of the most relaxed and scenic ways to get a view of both Mokoia Island and Rotorua itself. Fishermen also tend to have a soft spot for Lake Rotorua as it offers excellent fishing all year round, and catches can easily be made from the shore as well as aboard a vessel out on the water. The lake boasts a huge population of both Rainbow and Brown Trout that are generally quite generous in size, with catches of up to 7kg having been recorded. It's a truly wild fishery with one of the highest catch rates of any lake in on the eastern side of NZ, so if you're keen to do some trolling or drop in a fly then you'll likely be able to come away with a quality catch with a journey just minutes from the city centre. One of the main focal points of Lake Rotorua is Mokoia Island which lies almost at the centre of the lake's waters and is famed for the wildlife who call the speck of land home. The island has been used as a designated wildlife sanctuary for nearly 100 years, and is one of the best spots for bird watching and getting a glimpse of some of the rarest and most endangered of New Zealand's bird species – including Tui, Saddleback, Weka (or wood hens), Pukeko and, of course, Kiwis. The island is also steeped in history and culture, playing a sacred role in Maori society as a core feature of one of the culture's most widely-known legends of love and loss. 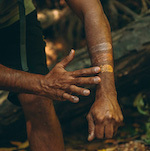 Tours are available that take visitors to the island while keeping an ecologically-focused attitude in mind, and allows for the chance to immerse yourself in a fragile, historical and largely untouched natural destination just a short boat ride away. Lastly, of course, the lake also serves as a focal point for various water-based activities, which vary from the laid-back to the upbeat; kayaking, sailing and jet boating in particular are popular pastimes, all of which are either rentable or bookable from offices situated along the lake shore. Plus, it's enough to simply grab an icecream from one of the nearby stores and simply take a stroll along the lake's waters. More than just a body of water, Lake Rotorua is an attraction in itself. The ideal starting point for any trip to Rotorua begins with a trip on Rotorua's Skyline Gondola which takes guests up the side of the city's Mount Ngongotaha to the activity-filled Skyline complex which sits atop the mount. It's likely one of the first things you'll want to do when you get to the city as travelling up the mountainside not only gives you great 180 degree views of the panorama of Rotorua, its lake, Mokoia Island and further off into the distance, but will allow you to get a sense of how the area is laid out and help orientate yourself for the rest of your time in the region. While the gondolas seat up to 8 people, if you're travelling with less then it's a good idea to try and sit with your back facing the mountain as the ride up is fairly brief and you'll want to gain the best possible views of the outlook on offer while you can. In all, if offers a quick, comfortable and convenient way to get to the peak. Once you've reached the top, you'll not only get a great view of Rotorua and surrounds (aim for a clear day if possible), but also be presented with a variety of other activities and facilities to take advantage of during your time there. In terms of facilities, there's a high quality restaurant with smorgasbord/buffet style food that allows you to experience some decent dining while taking in amazing views from its spacious viewing windows, a well-equipped cafe that provides substantial meals and decent drinks in its own right, and well-maintained toilets so you'll never have to simply “hold it in” like at many other lesser-equipped lookout points. On the activity side of the equation, the entertainment keeps coming as there are a range of popular things to take part in – perhaps the most obvious of these is the Skyline Luge. This fun ride allows visitors of all ages hop on their own purpose-built luge cart and then make their winding way down tracks which slope down the hillside. There are a choice of tracks on offer, with the “Scenic” route being more of a leisurely sightseeing experience as you'll get a range of vantage points to look out and admire the Rotorua scenery on the way down, while the other advanced track is much more of a thrill-based experience. It's a good idea to take the scenic track first, soak in the views and test your confidence levels on the vehicles and then step it up a notch by moving to the advanced track. Likely to be of special interest to those travelling to Rotorua with kids, it's one of the more unique experiences in the region – no snow required for this luge, friends – and buying a multi-ride pass will allow you to get a taste of each at a decent price. Kicking it up a notch from the luge is the sky swing, which takes participants on a thrilling ride 50m above the ground at speeds of up to 120 kilometres per hour; think bungy jumping in reverse. Not for the faint of heart nor weak of bowel, it's nonetheless a great way to get a rush as you're thrown into the sky, while garnering one of the best views of Rotorua and beyond available – assuming you can keep your eyes open. The swing is able to accommodate up to three passengers, and kids are welcome to join in as long as they are above 110cm (3 ft 7). If you're interested in doing the swing, gondola and luge, combined tickets are available that can help cut down on costs. In all, it's well worth investing the money in making a day of your trip up the top of the Skyline Rotorua facility, with plenty to entertain both adults and families alike.